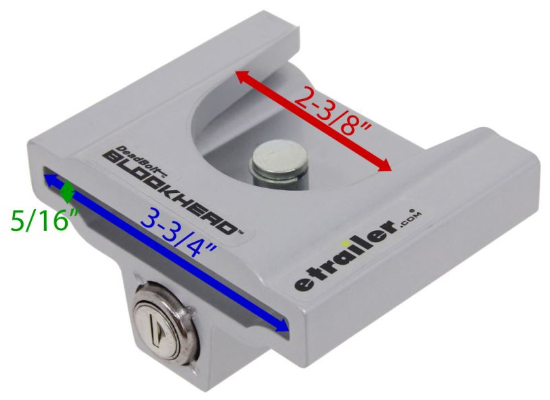 Hey Everyone, I was wondering what brand/model of hitch coupler locks (if any) everyone is using? I have tried two different models so far (Fastway Fortress and Masterlock 34) and in my opinion neither of them has fit securely on the yoke-style coupler of the [email protected] 400. Does anyone have any advice on locks that fit well on the [email protected] 400? 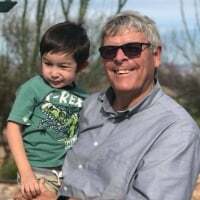 We are keeping our camper at a RV and boat storage facility, that is fenced and gated, but I still would like a bit more security for our investment while in storage, as well as in campgrounds when we are traveling. Thanks in advance! This one was recommended by another member. Watch the demo videos. Quite impressive, but very pricey. I have not confirmed that the one at this link is the right P/N for the [email protected], so confirm if you order. Maybe we should see if they would support a discounted group-buy. Here are some searches from the forum and a quote from RV veteran Dale Helman. 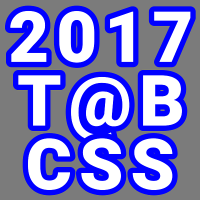 This topic has been discussed a great deal and you will find more info under the Categories “Trailers and Towing”. @klenger I looked at that one, but not sure if I'm ready to spend that much money just yet. @Sharon_is_SAM Thanks. I looked through all of the threads you mentioned. Lots of opinions and suggestions, but I guess I'm asking for specific brands/models that people are actually using and are happy with. @casadesaraymatt I know where you're at. Once I figure out which P/N to buy, I'll probably bite the bullet. Buying a good lock in the future doesn't protect you today. I may use a 2-step approach: (1) the hitch coupler lock, and (2) long cable and lock to a bollard post at the back of my storage spot. I suppose step 3 is State Farm Insurance. 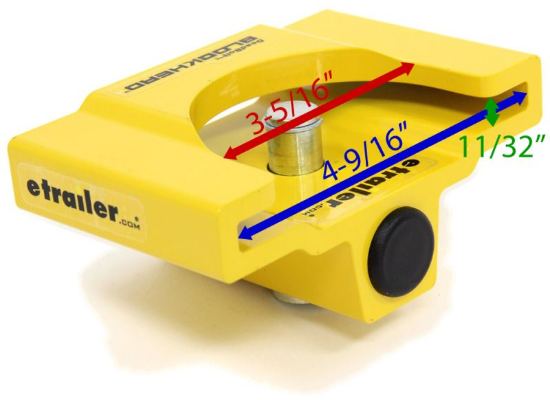 I have not taken delivery of the [email protected] yet (delivery on 01/24/2019 in Mesa AZ), so I don't have the dimensions of the coupler to know which lock to order. Could someone please measure the width of the lower flat lip of the coupler, preferably on a 320? See attached pictures for the possible dimensions. The dimension I am most interested in is the wider lip measurement. The measurement should be either 3-3/4" or 4-9/16". Thank you. @klenger, we have the blockhead lock. Bought the smaller lock first, but it was too narrow to fit. Had to get the larger size to fit. 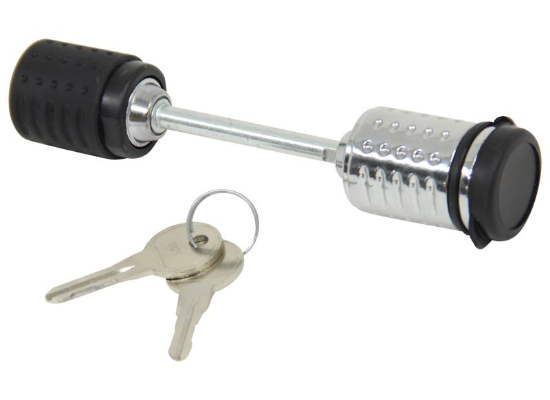 We do however, use the brahma wheel lock as the definitive measure of security. Good luck. Thank you. That would be the yellow one above. What complicates this issue is that the smaller lock is claimed to be used for both the 1-7/8" and 2" couplers and the larger lock is claimed to be used for the 2" and 1-5/16" couplers, but no mention of how to determine which one to use for the 2". Thus my question on the width of the lower flat lip. I looked at these for a long time and decided on this one. Simple design and will do as well as the more expensive ones. Nothing is failsafe. @mgreen2: I'm actually taking a belt and suspenders approach to the hitch coupler, using both a Deadbolt padlock on the upper latch and the blockhead lock on the lower ball socket. What's nice with the Deadbolt brand is that I can get them keyed alike. 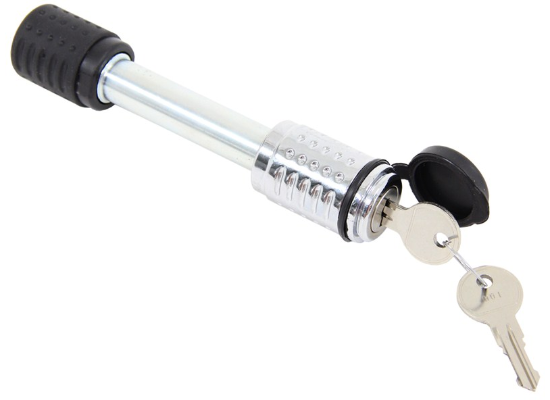 I will also get a 5/8" lock for the ball mount to receiver hitch as well as some locks for my bike rack, all using the Deadbolt brand locks, all keyed alike.